The FIFA World Cup in Russia has been hailed as one of the best yet and on social media, and Instagram in particular, it’s become one of the biggest. Instagram was one of the most popular social media platforms during the tournament with over 990 million interactions generated by content posted on the photo sharing site. 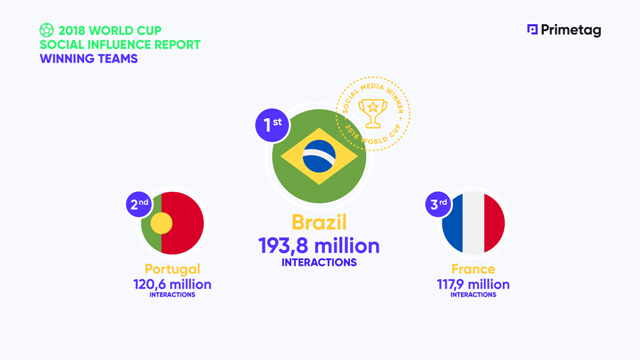 As France celebrated its second World Cup title, Les Bleus trail behind the tournament’s social media masters, Brazil who generated over 193 million interactions from 320 posts according to social media experts, Primetag who analysed data from the platform. Portugal, led by Cristiano Ronaldo, stood in second place with 120.6 million interactions with third place reserved for the tournament’s official winner, France, with the largest number of posts (390) and 117.9 million interactions. Despite the good will towards the England team from home fans, the nation’s social media interactions were only enough to see them finish 8th in the table from over 300 pieces of content and despite finishing fourth overall in the tournament. 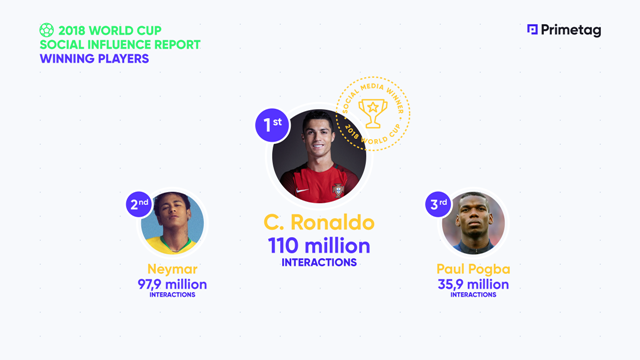 When it comes to the players, Cristiano Ronaldo was the undisputed king as he led the way with a grand total of over 110 million interactions from just 17 pieces of content, followed closely by Brazilian Neymar generating over 97 million interactions from 27 pieces of content and France’s Paul Pogba with nearly 36 million interactions from 40 pieces of content. No English players were present in the top 10. 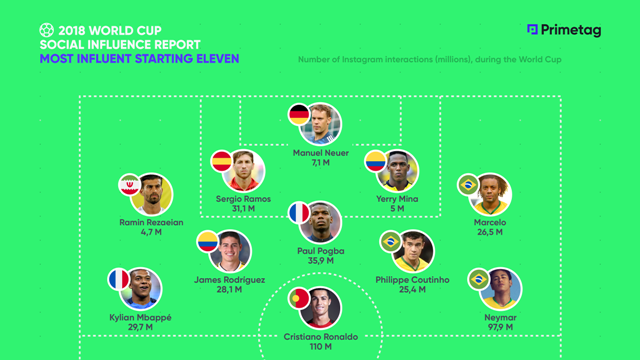 Ranking of player’s social media analytics on Instagram during the 2018 World Cup. 990 million (990,642,846) – number of interactions generated by the content. 287 million (287,703,784) – number of video views. 6,366 – number of images and videos that players have uploaded to Instagram. 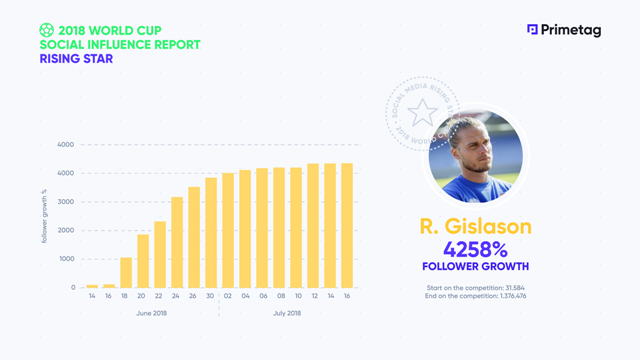 88% – percentage of World Cup players that are active on Instagram. Cristiano Ronaldo leads with 110 million interactions, a number which represents 92% of the entire Portuguese sum. Neymar makes it to second place after having uploaded 27 posts and garnering almost 98 million likes and comments. The bronze was earned by Paul Pogba, with 40 posts and 35.9 million interactions. The official winner of the World Cup owes 56% of its interactions on Instagram totwo players; France´s Pogba and Mbappé. A similar phenomenon is repeated with Sergio Ramos, who together with the interactions generated by Isco Alarcón and Marco Asensio, accounts for 70.6% of the noise generated in networks by La Roja. James Rodríguez (28 million interactions) represents more than half (56%) of the interactions of the Colombian national team. Determining the most influential eleven at the World Cup, a winning ´fantasy football´ team of from instagram based on the number of likes and comments generated by the players has been created. Germany’s sweeper keeper Manuel Neuer would be in charge of defending the goal, with the help of a defence comprising of Sergio Ramos, Marcelo, Yerry Mina and Iranian Ramin Rezaeian. In midfield Paul Pogba, James Rodriguez and Philippe Coutinho supply the passes to the forward stars of Cristiano Ronaldo, Neymar and Mbappe. Russia 2018 has been the year of the underdog and this has also been reflected in social networks, where Iceland, as at Euro 2016, were been the big surprise. Their midfielder, Rurik Gislason (1,376,476 followers; @rurikgislason), takes the ‘rising star’ award on Instagram. Since defending the Icelandic flag against Argentina on June 16, his following has increased by 4,258% to date.